McNutt and Quezon in Bicolandia - against a background of luxuriant palms and stone-markers of progress, U.S. High Commissioner McNutt and President Quezon were caught by the DMHM photographer last Sunday when they inaugurated the Manila-Legaspi line of the Manila Railroad at Del Gallego, Camarines Sur. The stone marker in the background record is the gratitude of the region to President Quezon whose early dream it was to open to railroad traffic the rich country of the Bicol provinces. 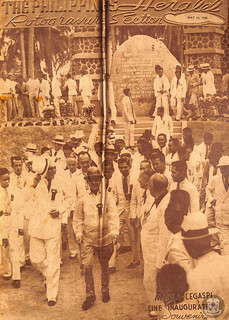 Recognizable in the foreground besides the High Commissioner and the President, are Speaker Gil Montilla, Floor Leader Ozamiz Assemblymen Dizon, Luna and Cabili, Major Hutter, detailed as aide to the President, H. "Andy" Anderson of the Manila Hotel, Manager Balmaceda of the national produce exchange and Governor Miguel Lukban of Camarines Sur.